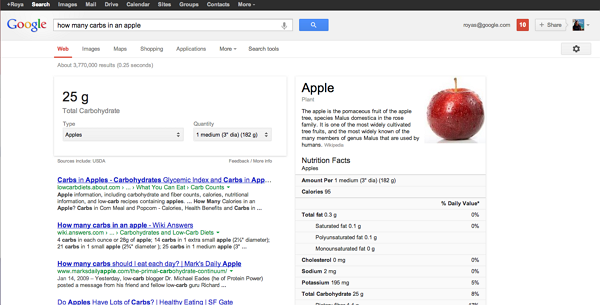 Google adds nutrition information for over 1,000 fruits, vegetables, meats and meals in search results. So users can know nutrition information like amount of calories and amount of proteins of specific fruits and vegetables. 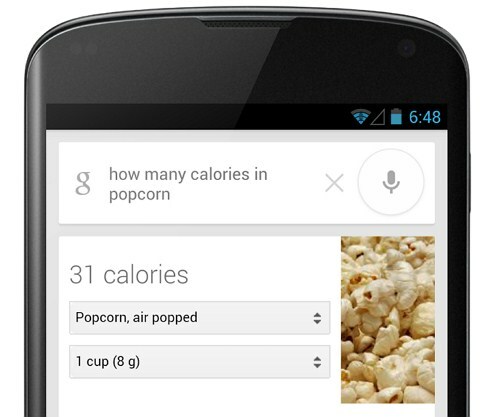 And also you can ask more questions related nutrition, Google gives perfect result for all your questions. This feature will be very useful for students. Google Product Manager Ilya Mezheritsky said "This new nutritional information builds on our work on the Knowledge Graph, which brings together all kinds of information from across the web that wasn't easily accessible. The graph helps us connect things that are related, even in cases when those foods have a completely different sounding name from what you asked. For example, when you ask for “summer squash carbs”, we include “zucchini” as a relevant food in the dropdown, because it is a type of summer squash." This feature will begin to launch today in English and will be rolling out in the US over the next ten days.